As you “up-to-date” Kansas Citians are well aware, we lost two business and civic titans in recent days — mortgage banker, philanthropist and political kingmaker Jim Nutter Sr. and Cerner co-founder Neal Patterson. One interesting element of the obituaries is that, because of the closeness of the first letters of their last names, their obits ran side by side, straddling two pages. 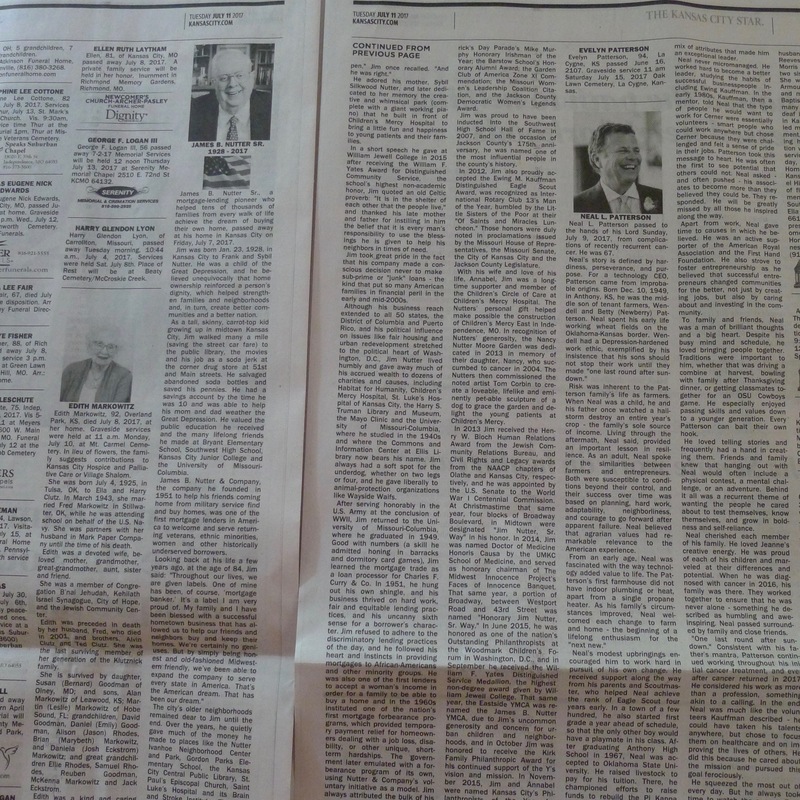 Had both obits been on the same page, they would have taken up nearly the entire page. What many of you might not know is how significant a source of revenue the obits are for the print editions of The Star and other major daily papers. The Star began charging for obituaries many years ago, before significant reader migration to the Internet and the over-the-cliff plunge in classified advertising. What The Star — and probably many other papers — expected to be bonus income from obituaries in the end turned out to be a lifesaver. By my calculations, each full page of obituaries generates about $6,000 in revenue. Wednesday and Sunday are the biggest days for obituaries, and today’s obits took up about two and a half pages — meaning The Star made about $15,000 on today’s obits. The Nutter obituary ran 479 lines, at a cost to the family of $3,800. The one-column photo pushed the cost to $3,900. Patterson’s obituary, at 300 lines, cost the family $2,500 Day One, about $1,450 Day Two (with a second-day discount) and about $200 in photo fees. One of my early editors told me to never make the reader do the math, so the grand total for both obits, with pictures, was about $8,000. Those guys are certainly worth the ink, and I’m sure their families aren’t complaining about the price. Both guys made fortunes. My 101-year-old grandmother passed away late last year. The Star wanted +$600 to run her obituary with a small picture. We cut out all her survivors names except her children and still paid $350. The Pittsburgh Post-Gazette (her hometown) ran the original obit with picture and only charged $200. The cost of my Dad’s obit in the Louisville Courier Journal was about $800 if memory serves, which was more than the cost of his cremation. Of course I embellished it some. Embellishing is good, Leigh. You only go out once, so make the most of it. One of my Louisville uncles who died a few years ago went in the other, wrong direction. He had been a top-notch lawyer. Served as an assistant county attorney for many years and, on the private side, represented several big companies, including Budweiser. His obit was very short and, about his legal career, said only, “He was a lawyer.” He wanted to be understated but, in the process, underestimated his accomplishments. I just spoke with Pat O’Neill, a longtime friend and associate of Nutter. O’Neill, a public relations and marketing consultant, said he wrote the obit and that he and Nutter had worked on it periodically the last several years. “He’d say, ‘Come on over and let’s talk about my resume,’ ” O’Neill said. O’Neill said that once, after an old Southwest High School classmate of Nutter’s died and had a long obituary, Nutter asked if his own obit would be longer than that of his classmate. O’Neill said he printed both obits on 8 1/2-by-11 sheets and taped the pages of the respective obits together. When he held them up side by side, Nutter’s hit the floor and the other fellow’s did not. Nutter, who had a very playful side, got a kick out of that, O’Neill said. Funerals, American style, are last great ripoff of the vunerable. I wouldn’t say the last, Rita, but certainly one of the most pervasive. I recall that it raised a bit of a ruckus when the Star transferred obit writing to the classified ad department. That was a big change from the time-honored practice of news desk people writing obits as a public service. And this was in the 90s, when the Star was extremely profitable. Besides negative publicity over the philosophical implications of that change, I remember that obits were riddled with typos during the first month or so of the new, higher-profit way of doing things. Even though it’s been more than 20 years since The Star began charging, some people are still under the impression they’re free. Actually, they are a lot better now — much more personal and interesting — than they were when we (reporters) were doing them and following a template. They were basically all the same, just substituting different names, relatives, occupations and memberships. This is a much better system, and The Star desperately needs the money. I was doing some more figurin’ this evening, and I am going to guess the paper takes in about $3 million a year on obits. Multiply that by about 10 and you’ve probably got close to what the entire McClatchy chain makes on obits annually. Good reporting, Jim! We appreciate you doing the math for us. And the obits are a lot more personal now. The families are paying for them, so they can write them any way they want to. I’m just glad The Star gives the first 8 lines free of charge. I hope that does not change. A lot of families appreciate that. Many metro papers, including St. Louis, charge for every line.